The Magic Kingdom is the world's most visited theme park, so it's incredibly important that you choose the right time to visit. Choose well, and you will breeze through the park, but choose poorly, and you may find yourself waiting in line for hours to climb into one of Space Mountain's rocket ships. Overall, the best time to visit the Magic Kingdom is during the off-peak months of September and January, when the crowds and costs are at their lowest. However, by visiting during the off-peak season, you also may miss out on the special events that occur during the more popular months, so decide what matters most to you before picking a time. The Magic Kingdom is divided into sections, with Cinderella's Castle at the heart. The six lands are Frontierland, Fantasyland, Adventureland, Main Street USA, Liberty Square, and Tomorrowland. The areas are highly themed and incorporate different smells, sounds, foods, and foliage in each section. Your tastes, as well as the ages of your children, will dictate where you spend the most amount of time. The little ones can't get enough of Fantasyland where their favorite film stars come to life through the area's rides, and in-person meet and greets, whereas older children and teens will most likely prefer Frontierland, where very popular rides like Splash Mountain and The Haunted Mansion reside. How Much Does It Cost to Visit Magic Kingdom? Disney introduced controversial surge pricing for tickets at the Magic Kingdom 2016. Each day of the year is classified as a “value,” “regular,” or “peak” day, and follows the pricing structure that has been in place for the onsite hotel rooms for years. However, since pricing is calculated on a day to day basis, you may find that visiting on Easter Sunday is more expensive than going on a weekend day during the summer, depending on past attendance records. Disney is transparent with this pricing structure and publishes a calendar detailing which days fall into each category. Florida is known for hot temperatures, high humidity, and plenty of sunshine, year-round. The temperatures are at their most severe in July and August and regularly climb into the upper 90s. From October through May, the weather is more moderate during the day but can be chilly at night and in the early morning. Hurricane season spans from June through October, though the chance of a hurricane hitting Florida during your stay is slim. The months of June, July, and August are without a doubt, filled with guests, but you may be surprised to learn that the Christmas season can be even more crowded, depending on the day. In terms of low crowds, mild weather, and the best pricing, September and January are the very best times to visit. February, May, and early November are also a great choice, though you can expect somewhat larger crowds and slightly higher prices. If you must visit during summer, avoid the weekend (including Fridays), as they are without a doubt the busiest days. Whether or not you are an early bird, your best plan of action is to head to the Magic Kingdom on any day at least 15 minutes before opening. If you are relying on the Disney Transportation System, allow at least 30 minutes of travel time to arrive at the park entrance. Coming early will enable you to be one of the first guests to enter the park, and head quickly to your favorite attractions that will be packed later in the day. If you opt to stay on property at a Disney resort (such as The Grand Floridian, Pop Century, or Port Orleans), you have some added benefits when visiting the Magic Kingdom. When you check into your hotel, pay attention to the daily park schedule you receive as part of your check-in package. This schedule will list the Extra Magic Hours available only to resort guests during your visit. The Extra Magic Hours are the best times to visit. They are designed to allow resort guests an extra hour, either before the park opens or after it closes, to ride popular attractions like It's a Small World, Big Thunder Mountain Railroad, and Space Mountain with minimal wait times. If you're staying offsite, or even at a Disney "good neighbor" hotel that sits on the edge of Disney property, you, unfortunately, won't be able to take advantage of Extra Magic Hours. Your best bet for visiting the Magic Kingdom is going midweek on either a Tuesday or Wednesday. Thursday is usually a little more crowded but a far cry from the weekend crowds. If you can't bear the thought of waking that early, you can go the night owl route instead and arrive at the park in the early evening. You should make a dining reservation for either 4 or 5 p.m., then hit the rides when you are finished (if you can stomach it). Beginning around 6 p.m., park crowds start thinning out as guests make their way to dinner, so you can take advantage of this time gap. Spring can be a nice time to visit Magic Kingdom, as the weather is usually quite pleasant, but beware of crowds—predictably, Magic Kingdom is an immensely popular spring break destination, and it shows. May, before Memorial Day weekend, can be an ideal time to visit if you want to avoid crowds. Summers are peak season at the park, and the weather can be less-than-ideal. Temperatures are often hot, and Florida's humidity is at its most extreme. If you must visit during the summer, visit in late August; it will still be hot, but the crowds have begun to die down as more kids return to school. Typically, September and early fall is a great month the visit Disney World. Kids are back in school, so crowds are dwindling. Fall (through November 30) is hurricane season in Florida, but the odds of that affecting your trip are unlikely. A late fall trip, between Thanksgiving and Christmas, can be ideal if you want great weather and minimal crowds. Mickey's Not-So-Scary Halloween Party is a festive fall celebration held in late September and October. Winter offers ideal weather, but the park does have reduced hours and sometimes scaled-back entertainment which can be disappointing for guests. Florida is still generally dry, but occasional cold fronts do blow through. The park does have some special events during the winter months, ranging from a traditional Christmas celebration to a marathon run through the park. Mickey's Very Merry Christmas Party is usually held in late November and December. 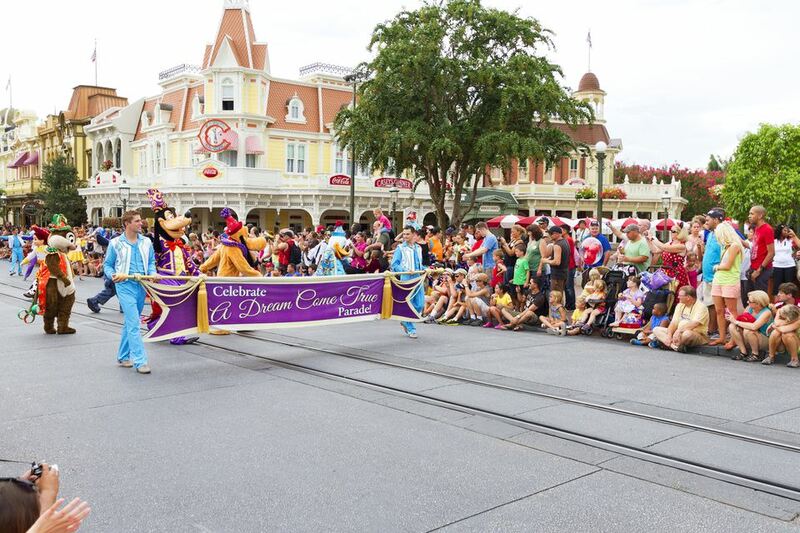 The Walt Disney World Marathon Weekend takes over the park in January. The race series includes events for kids as well. Just for women, the Disney Princess Half Marathon Weekend is held each year in February. Disney Decisions: Should You Get the Park Hopper Pass?